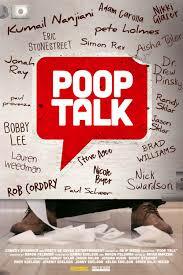 Docu-comedy, Poop Talk, is set for theatrical release nationwide on February 16th 2018. Considered to be this generation’s The Aristocrats, Poop Talk is an open and honest look at a taboo topic in today’s society: poop. Watch the Trailer here: https://www.youtube.com/watch?v=IrzZ0ceFyRY. The Comedy Dynamics documentary gives an inside look at all-things poop, from uncensored, embarrassing moments to scientific explanations recounted by 50 experts and comedians, including Eric Stonestreet, Kumail Nanjiani, Dr. Drew Pinsky, Nicole Byer, Adam Carolla, Rob Corddry, Nikki Glaser, Pete Holmes, Jonah Ray, Jordan Rubin, Randy and Jason Sklar, Nick Swardson, and many others. It’s an authentic and hysterical exploration into how we as a society deal with poop and what it reveals about who we are.